This is Acer's new giganta-smartphone, the Liquid S2, and it's sitting on a fairly impressive secret: it's the world's first phone to pack a 4K-capable video camera. Shout "overkill" or "progress", whichever you prefer, but either way it's an impressive feat squeezing such a sensor into the body of a phone. 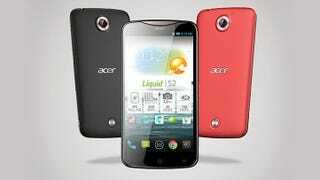 Not that this is an Android handset without some space inside: its 6-inch screen gave Acer plenty of room to play with. Lurking within its body is a 13-megapixel rear camera with LED ring flash, a 2MP front camera (itself capable of 1080p video), a Snapdragon 800 chip clocked at 2.2GHz, 2GB of RAM, 3,300 mAh battery, and 4G LTE connectivity.